French police squad getting ready to shoot tear gas at the crowd assembled to protest police crimes in Bobigny (northeastern Paris banlieue). / Photograph by Léopold Lambert (2017). This essay was first published in The Funambulist, a magazine that examines the politics of space and bodies. It forms part of the November–December 2017 issue, "Toxic Atmospheres," which "draws on the concepts of 'being-in-the-breathable' (Peter Sloterdijk), 'the weather' (Christina Sharpe), and 'combat breathing' (Frantz Fanon) to resolutely politicize what is usually approached through an environmentalist perspective" — and includes contributions from Aamer Ibraheem, Patnarin “Trong” Wongkad, Imran Mohammad, Ylan Vo, Samia Henni, Lisa Torio, Sonia Grant, Chanelle Adams, Sarah Boisard, Christina Sharpe, Jessika Khazrik, and Alexandra Cortez. Pourquoi ça gaze autant ? Chez nous y’a pas l’OTAN. Alors si y’a la guerre, ça va durer longtemps. (Why so much gas? Back home, there’s no NATO. 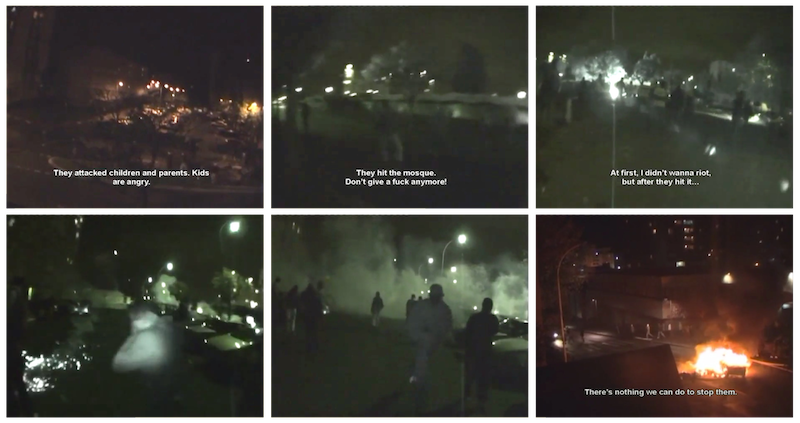 After the deaths of Zyed Benna and Bouna Traoré, two young inhabitants of a Paris banlieue, during a police tracking in October 2005, revolts in Paris banlieues took place for several weeks and then rapidly spread all over France. During the fourth night of combat between the police and the inhabitants of the cité (i.e. “housing projects”) Les Bosquets, the police threw a teargas grenade in the mosque in which Muslim residents were praying during the month of Ramadan. This event defined the frame of discussion of what was happening in Les Bosquets. The combination of toxicity as such and of what was seen as the contamination of sacred space created a sense of scandal that erased all the structural reasons behind the revolts in the first place and how the population itself saw this particular aggression against the mosque. In the following days, no word was uttered in the media about the many, albeit less spectacular grenades that exploded every day in Les Bosquets, and in other cités, and only a few words were spoken about the ton of grenades that were thrown before and after this event. Nothing was said about the life of teargas grenades outside the scandal of their explosive spectacle. Indeed, a major contradiction lies at the core of the representation of teargas grenades. On the one hand, these grenades operate every single day in the world, and also potentially everywhere: in occupied territories when the colonized reclaim their land as in Palestine or North Dakota, in urban ghettos in the peripheries of imperial metropoles throughout the West, when inhabitants rebel against the colonial management of their life, in any country of the Global South when the postcolonial state fails to realize its old promises, in the center of imperial metropoles during class protests in times of so-called “crisis” of capitalism. Despite their pervasiveness in the everywhere-and-every-day, teargas grenades are definitely not seen as everyday objects of modern life. Teargas grenades are associated with the logic of event. A teargas grenade explodes with an aura of spectacle, appears during a clash and supposedly in response to a given event. Although the metropolitan leftist activist may occasionally experience the effects of teargas grenades, the latter do not compose an everyday aspect of their life. Toxicity, in our colonial context, is an event only for the privileged while it composes a fundamental aspect of life for the colonized. The combination of the spectacular aspect of the explosion and natural focus on the damages and death caused by teargas grenades produces a form of disinterest for their everyday life: their production, their link to modes of thinking and, above all to the everyday process of oppression leading to the experience of gas. We instinctively tend to look at teargas grenades as if they suddenly appear when an agent of repression throws them, without questioning how they reach these hands, how they were thought up by the master and what they point to in the structures and systems of thought that rule our lives. 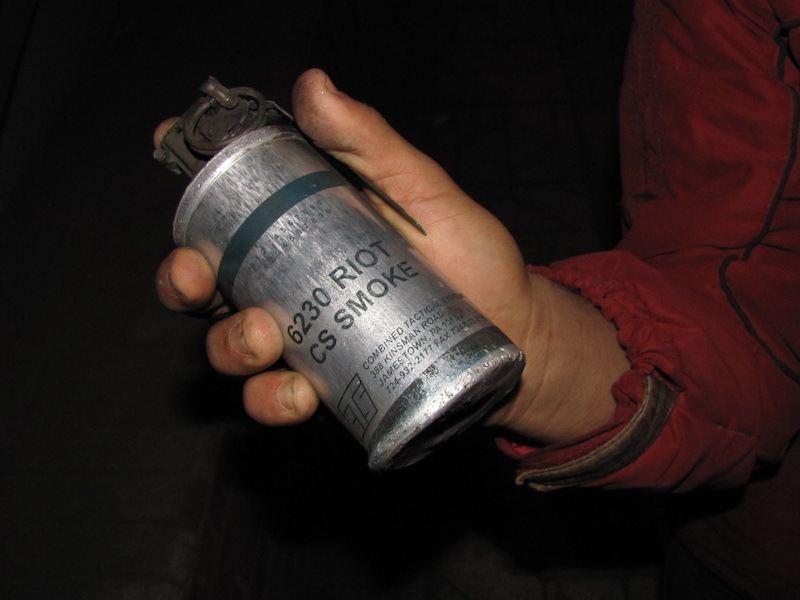 U.S.-made tear gas grenade in Egypt. / Photograph by Sherif9282 (2011). When leaving the aura of spectacle of the explosion, one can turn the gaze to the transnational infrastructure that represents the production, promotion, and dissemination of teargas grenades around the world. Since killing has been made a business, teargas grenades follow rules of production along classical lines of transnational capitalist distribution. Grenades are distributed along particular modalities that reflect relations of power between states and armies. The lines of distribution illustrate neocolonial relations of power between metropoles and colonies. These networks also bring to light already obvious alliances between states, such as the Israeli occupier receiving the weapons it does not itself produce from the U.S., and Colombia from Brazil. A few clicks on some of the most mainstream parts of the internet allow one to gather tactical and concrete information, such as locations production sites, official contracts, etc. For example, the grenades used against the people in Egypt during the 2011 revolution were the same as some used in Tunisia at the same time, which were also found in occupied Palestine. They are produced by Combined Systems Inc. (brand name Combined Tactical Systems — CTS,) a “tactical weapons company," whose main production site is in Jamestown, Pennsylvania, USA. The lines of distribution of CTS follow the lines of U.S. policies: in this case, the support of the genocide of Palestinians and of the Egyptian and Tunisian dictatorships. CTS clients include the U.S. Army, U.S. Customs and Border Patrol, the U.S. State Department, Rafael Advanced Defense Systems, and Israeli Military Industries — both of which are weapons companies based in occupied Palestine. But CTS also exports to Yemen, Germany, the Netherlands, Greece, India, East Timor, Hong Kong, Argentina, Chile, Bolivia, Guatemala, Thailand, Trinidad and Tobago, Cameroon, and Sierra Leone. In France, where one of the new president’s first decisions consisted of purchasing 1.2 million grenades — including teargas — for the police on a 4-year contract, the exclusive furnisher of the police is ALSETEX and the location of its factories is available to the public. Setting aside the logic of event and the spectacle of the explosion allows us to reveal the existence of a gassing industry that constitutes the infrastructure of the police on a transnational scale. Police are materially dependent on uninterrupted production chains in small factories located in imperial metropoles that do not even hide their address. Escaping the spectacle, then, consists of realizing the concrete nature of the police infrastructure on a global scale. These production chains can easily be traced, factories localized and chains of production perturbed in a logic of direct action. U.S.-made tear gas grenades in Egypt. / Unknown photographer. Such shift of perspective allows one to think of concrete practices of transnational solidarity and struggle. One should not be surprised that actors on the ground already call for coordinated transnational action. In 2013, the Turkish police faced revolts and used its annual stock of 150,000 teargas grenades within the first two weeks of the revolts, hence finding itself out of supply. The Turkish state had to mobilize diverse networks urgently in order not to find itself defenseless. In this context, one of the first demands made by diverse groups within the revolt was to call on people located in production countries to perturb the production and shipment of these supplies. Although this possibility was not concretized, the situation showed potential for transnational solidarity and the need to develop concrete insurrectional knowledge about the nature of police infrastructure and its dependence on private companies located around the globe. In the context of countries of the Global South, such a way of thinking is also a path open to new modes of diasporic struggle since grenades used in a country are often produced in the metropoles to which people emigrate. For example, the last grenades found in the Rif, a region in Morocco where a struggle is going on against the central state, were coming from France, as were most of the weapons used against Tunisians during the revolution. In fact, the French state is linked to a special company named Sofexi (Mark Group) that centralizes the shipment of diverse materials, from outfits and trucks to surveillance drones and teargas grenades, that compose the infrastructure of police in ex-colonies of the African continent. Sofexi’s factories are tellingly located in a Paris banlieue named Gennevilliers, a city that concentrates a large population of people linked to colonial and “post-”colonial histories of immigration in the metropolis. Gennevilliers is also situated a few minutes away from Paris, where mobilizations against police violence have been growing for a few months; yet, this proximity has passed unnoticed. 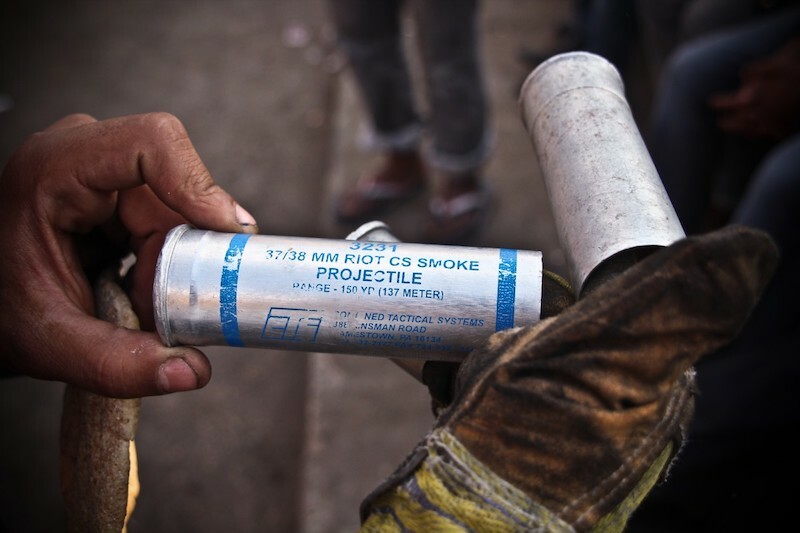 U.S.-made tear gas grenade in Bahrain. / Photograph by Mohamed CJ (2011). However, besides and above the materiality of teargas grenades as objects, the travel of these weapons is always also the travel of specific forms of knowledge. A few years ago, during the Tunisian revolution, French Minister of Defense Michelle Alliot-Marie reacted to this revolt by offering “France’s well-known knowledge in the maintenance of public order” to the dictatorship. And indeed, Sofexi’s website does not only display material weapons but also advertises its “formation” offer, a part of the website that is eloquently illustrated by an image of a civilian white man in the desert standing in front of a group of Black men wearing army uniforms. 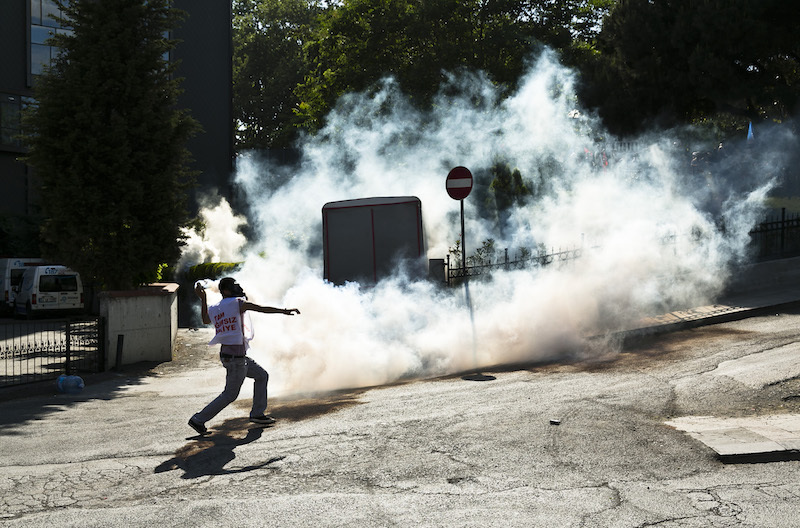 Turkish police teargas during the protests and occupation of Gezi Park in Istanbul in the summer of 2013. / Photograph by Eser Karadağ (June 2013). Reflecting on the relationship between the teargas grenade and the forms of knowledge that go hand-in-hand with it shows the way in which, above their murderous materiality, these grenades emerge from a specific location: Western secular humanism. In official discourse, teargas grenades are framed as “non-lethal” weapons used to control masses without inflicting death. A sense of tragic irony even emerges when Combined Systems Inc. names its website “non-lethal.com.” This concept of a “non-lethal” weapon is a key to study the link between teargas grenades and the liberal narrative of clean war, “soft” and “democratic” repression. This narrative is itself intertwined with imperial narratives of progress and civilization called “humanism.” While “riot control” and teargas grenades have now been rendered quasi-universal, the whole process of developing of teargas grenade is so dependent on the development of Western secular humanism that the two genealogies cannot be separated. Teargas grenades are humanist. Teargas grenades were initially designed for chemical warfare. They are the result of a complex intertwinement of science and war projects and the meeting of two technologies: the grenade and chemical weapons. While the genealogy of the hand-grenade stretches as far back as the 17th century with French King Louis IV’s grenadiers, chemical weapons such as teargas were born in the 20th century as a result of the war effort prior to WWI. The meeting of these two technologies indeed occurred during WWI, when the French army used teargas grenades against German troops in the battle of Ypres. The history of teargas grenades is deeply linked to modern conceptions of (in)humanity, cruelty, and pain. The modern/colonial conception of the human is grounded in the figure of an agent who acts violently against pain and above all, without cruelty. Such centrality of the struggle against pain and cruelty shows itself in full light with the history of teargas grenades. While teargas grenade were deemed the most humane weapons during WWI, they came to be seen as a symbol of inhumanity shortly after the war and the trauma that it caused in the Western mind. The symbolism of gas was deemed more monstrous with its genocidal use during the Holocaust. Nonetheless, teargas grenades survived this self-reform of modernity precisely because they were “non-lethal” and therefore more humane. This reformed conception of the human implied that war now had to be rapid, efficient and precise in order to win without inflicting an excessive amount of pain — a self-reform that did not prevent Western armies from using chemical weapons on colonized population during wars of decolonization. In 1997, the United Nations created the Organization for the Prohibition of Chemical Weapons (OPCW), which enforced a treaty that banned the use of any chemical weapon in warfare. Such transition is part of the global imperial narrative about “clean war.” However, the treaty creates an exception for “riot control” in stating that “Each State Party undertakes not to use riot control agents as a method of warfare.” This point causes the liberal narrative of progress and soft repression to implode since teargas grenades are actually recognized as chemical weapons by the states using them domestically. In the context of the reform of humanism, this exception shows the way in which as humane weapons, teargas grenades are not deemed illegal but rather paradoxically reinforce the humanitarian narrative of international law. In this context teargas grenades pass from being chemical warfare weapons used in police operations to police operation weapons not to be used in warfare. Gassing, then, moves from being the most inhumane act of warfare to the most humane part of the art of policing. Therefore, in the context of the reform of humanism exposed above, the narrative that equates “riot control” to humanist repression must be understood within the larger narrative of humanization of war, not as an exception to it. For certain targeted populations, there is not one moment in which death occurs. Rather, death is an always ongoing process provoked by the debilitating effect of management of bodies by colonial technologies of power. The narrative of quick/smart/efficient/humane war erases the slow, never-ending experience of murderous colonial treatment. The term “asphyxia” here demands a concentration on gas and toxicity beyond the grenade itself and the ways in which racialized bodies are constantly exposed to toxic violence through the racial management of their space, health, etc. Therefore, the contemporary use of teargas grenades in racial policing is similar to their use during WWI because teargas grenades are used as part of a systematic death machine targeting specific bodies labelled as to-be-killed. From this Other perspective on teargas grenades, the humanization of war intended by the narrative of “non-lethal” weapons rather shows itself as a naturalization process of colonial warfare. 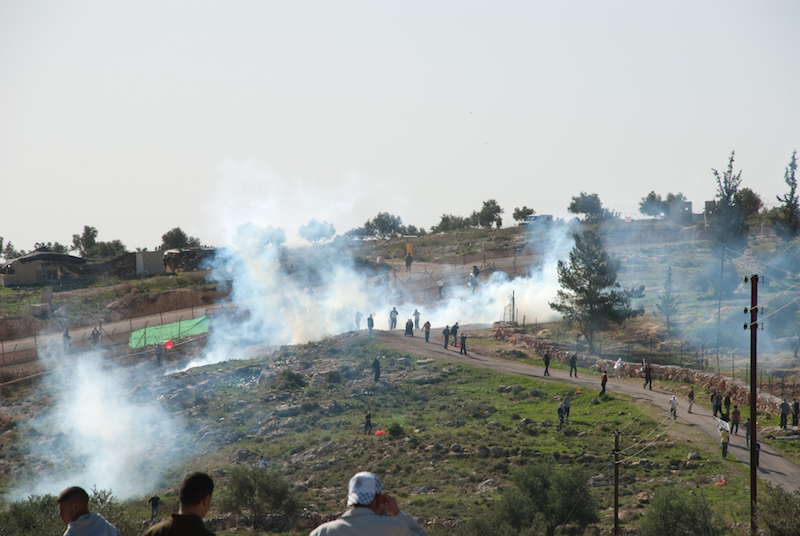 Israeli tear gas at the weekly protest against the Occupation in Bil’in (West Bank, Palestine). / Photograph by Ian McKellar (2010). While the concept of “non-lethal” is meant to hide this continuity of warfare from the battlefields of WWI to policing in colonial contexts, thinking of teargas grenades from the standpoint of racialized bodies makes visible that soft/humane policing is always warfare, and more specifically chemical warfare. Chemical warfare is sometimes slow and sometimes quick but always present. Screenshots of the short film “365 jours à Clichy Montfermeil” (365 Days in Clichy Montfermeil) by Kourtrajmé and Ladj Ly (2005). This intrinsic link between teargas grenades and the development of secular humanism has to be related to a singular conception of space held by the police, which is itself located within a secular conception of space. Coming back to the episode of the mosque with which we opened this meditation puts into light the dependence of the police on a secular conception of space that equates it with a space of war and justifies the violence of police. At first sight, the police attack against the mosque conveys a sense of contamination, enhanced by the symbol of gas. The police, as in French colonies, commit sacrilege against the place of worship of the colonized. The teargas grenade thrown by the police is therefore seen as crossing a border. The centrality of this movement of crossing in public discourse is demonstrated by the fact that one of the main points of debate in the media and political discourse was whether the teargas grenade exploded near the entrance and that gas then entered the mosque, or if it instead directly exploded inside. The whole apparatus of counter-insurgency composed by the media, politicians and journalists therefore focused on the movement of crossing, by which they meant the crossing of the secular/sacred binary. In this discursive system, the conception of space that is revealed derives from the secular/religious or profane/sacred binary. While this approach to space recognizes the existence of a transgression, the concept of transgression that is implied by it is problematic. Indeed, it would imply that if the grenade was not targeting the mosque, then throwing the grenade at inhabitants would have been morally justifiable — and indeed, it would have been legally justifiable, which is the whole point. The focus on the border between the sacred and the profane functions as an implicit justification of violence in the sphere of the profane. In Other words, the reversal operated by this secularist discourse does not mean that violence should be limited to the profane, but that the profane is a violent space in which violence is the norm. But since the “sacred” here is attacked, and that such kind of attack is a colonial tradition — one only has to see the rich literature in counter-insurgency studies written about intervention in “sacred space” that fills entire shelves in the international studies sections of most Western universities — we understand that in fact, it is space as such, in the secular mind of the police, that is essentially violent. In this secular mind, the division between sacred and profane spaces allows the totalization of a space of violence while also performing a hypocritical defense of the “sacred.” To secularism, and hence to the police, there is one space, and this space is intrinsically violent. More deeply, this conception of space structurally limits the scope of “the sacred” to the sphere of the “sacred proper,” namely the mosque which is therefore produced as “private” space since secularism limits “religion” to the private. Even more than this, the dichotomy creates “religion” as such through its privatization — conversely creating the “secular” through its publicization. Here, this conception of space encapsulates Islam and its followers to the space of the mosque, therefore repeating the Republican/colonial exigency of a public space “free” from religion. While in the mosque, the subject is a fanatical worshipping Muslim whose community should be infiltrated, in the street the same subjects are (second-zone) citizens disposable to state violence. While thinking space according to this secular/sacred binary allows to make visible a transgression, it already implies subscribing to a singular conception of space held by the police and reinforces secularism and its colonial war on Muslims. Here we find ourselves in the old perverse colonial blackmail: in order to be recognized, you must subscribe to the philosophy of the master, the same philosophy that is the source and justification of his violence. On the Other hand, thinking outside this secular epistemology and conceiving of space from within Islamic cosmology, which does not conceive of any separation between “the sacred” and so-called “profane”, would allow one to confront the attack of the mosque not as excessive or exceptional but rather to oppose it on moral grounds in its entirety. From this perspective, opposition to the grenade in the mosque would not only be a challenge to the police for its occasional violence, but against the system of thought on which colonial violence is grounded. The sense of scandal here would not induce a hypocritical defense of the mosque as a sacred enclave in a disenchanted world but rather, the intransigent affirmation of the divine nature of space as such. From this point of view, the scandal shifts from this particular grenade in this particular place to any teargas grenade and any aggression from the police through the corollary and all-the-more intransigent affirmation of the sacred status of the colonized’s lives. In this context, what becomes scandalous is the very order in which they make people live — an order that amounts to a fundamental transgression of Life itself. The point to deduce from these last thoughts is that although we might, and should, mobilize to disrupt the material infrastructure of the police, the question will not be resolved. Behind the cloud of teargas grenades, a whole civilization hides itself: secular modernity and its funerary trail of genocidal knowledges and ways of life. In the material world in which they make us live, it is life itself that has been made toxic. It is up to us now to come back to Life. Dariouche Kechavarzi-Tehrani is a student in Paris. 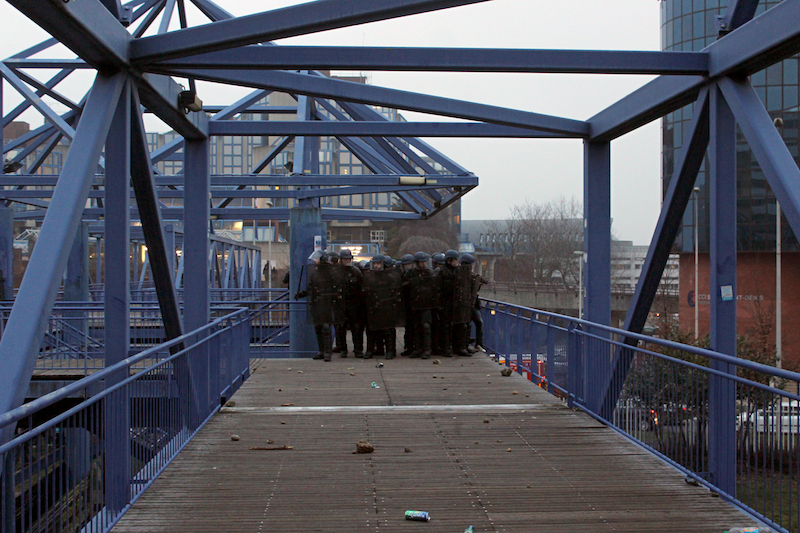 He follows movements against police violence in Paris banlieues. He is interested in the link between secularism, colonialism and Christianity and the way in which this link frames State institutions.